Encourage your clients to socialize with others. Clubs: What are your clients' favorite hobbies and activities? Whether they enjoy quilting, gardening, reading or anything else, there is likely a club they can join to share their passion with others. Senior centers: Senior centers consistently offer fun and exciting classes, meetings, games and activities for seniors to get involved in. Consider finding a senior center in the area and going with your client to check out everything they offer. Pick up a schedule of events and keep track of what's coming up. 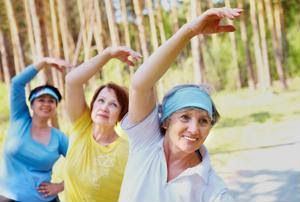 Fitness classes: Knock out two birds with one stone by encouraging your clients to get involved in senior fitness classes. Local recreation centers, gyms and the YMCA are good bets for finding healthy and fun classes your clients will enjoy.